One of his favorite recipes is Bacon and Cheese Stuffed Meatloaf. 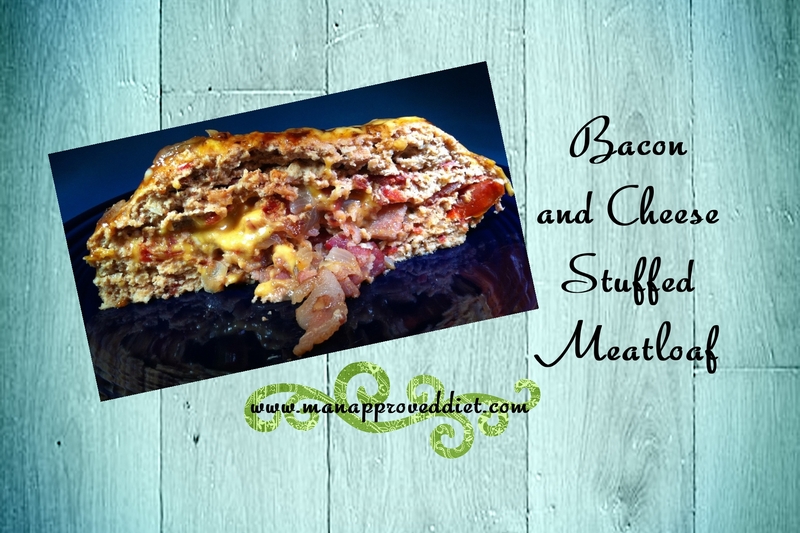 Normally he doesn’t like meatloaf, but just add some bacon and cheese to it and it becomes one of his most requested recipes. Preheat the oven to 400 degrees. Combine the diced tomatoes, garlic, breadcrumbs, ground turkey and barbecue dry rub in a large bowl. In a saute pan, cook the bacon and onions until the bacon is crispy. Drain well on paper towels. Line a bread pan with foil. Put half of the meat mixture in the bottom of the pan, creating a depression running down the center of the loaf. Fill the depression with the bacon mixture and half of the cheese. Cover with the remaining meat mixture, ensuring that the bacon and cheese are sealed in. Bake covered for 30 minutes. Top with the remaining barbecue sauce and cheese, bake for another five minutes or until the cheese is melted. To make it in the microwave instead of the oven, form the meatloaf in a microwave safe container. Cover it and microwave it for 18 - 20 minutes. Top with the barbecue sauce and cheese, cover and microwave for another 3 - 5 minutes. Great recipe and healthy too! Oooh yum!! Totally making this asap!! Two of my family's favorite things all mixed together!! Wooo!! I bet it will become a favorite! wow this looks like an award winning recipe! I haven't made meat loaf and so long, this yummy recipe will get me hopping to it!!! This looks so good! I haven't made meatloaf in ages, and wow, this is one to make!!! Nice you have a taste tester!